Browsing the web before can only be made once that you have a computer on hand. But today, you can browse anytime and anywhere you want with the help of your smartphone devices such as your iPhone. However, there are actually instances that you will encounter an error when you try to browse using your Safari web browser. 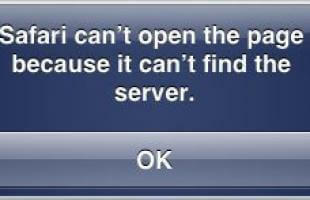 Once error that you may encounter is “Safari cannot open the page because the server cannot be found”. Note that Safari browser is the most recommended browser to use if you are using any Apple device. Do not worry, because just like any other issues that a smartphone can have, such as your iPhone device, fixing this is a piece of cake. You do not have to stress out yourself looking for someone to help you with it because you can surely do it on your own. All you have to do is to have the knowledge and the tricks that we are going to provide and you are all set. If you are actually having this problem with your Safari web browser, then this article is for you. We are going to show you some tricks on how to solve this error so that you will be able to use your browser again. Here are some easy tricks that you can do on your own for you to be able to fix the problem that you are encountering when you are trying to browse using your iPhone device. You can try to do any of these solutions that we are going to provide for you to know which one will work best for you and which one can help you in fixing the problem. There are instances that the issue that you are having is because of your internet connection. This is actually the first thing that you should do before doing anything else on your iPhone device. You have to make sure that you are connected to a stable Wi-Fi connection or to your cellular network connection which you can check under the Settings of your iPhone device. You can also check if your Airplane mode is enabled. Keep in mind that a bad internet connection is one cause as to why you are not able to open a certain page using your Safari browser. If you are actually entering the website address or the URL, make sure that you are entering the right one. Remember that a single mistake such as spelling or a command can cause you not to open the website that you are trying to access on your Safari browser on your iPhone device. If you have already checked your internet connection and the URL is entered correctly and you still cannot access the webpage from your iPhone device, then it is time for you to do the next step. This is by cleaning your cache and your data on your Safari browser on your iPhone. This happens because there are instances that a conflict occurs regarding the data that you have previously opened on your Safari browser. Here is how you can do this. Step 1: Go ahead and launch Settings on your iPhone device and then choose “Safari”. Step 2: Then, go ahead and tap on the “Clear History and Website Data” option. Step 3; Once done, go ahead and try to launch Safari browser on your iPhone. Then access the webpage that you are working on. Try to check if the problem still persists. If so, go ahead and proceed with the next solution. Another trick that you can do for you to fix the problem is by using the IP address of the URL that you are using to search on your Safari browser. If in case that you do not know the IP address, then you can go ahead and use a tool to help you in finding the domain from the Internet. Once that you are able to access it using this trick, then it only means that the error is in regard to the DNS server problem. This is what you need to fix. As what we mentioned earlier for trick #3, the problem can be with your DNS settings. The reason why you are experiencing a hard time accessing a webpage is that you are actually not using a reliable DNS server. DNS is known as the domain name system which is commonly used for all users to load a certain webpage over the internet. What it does is that it actually tries to convert the webpage URL to its IP address. This is because it is easier to recognize. With this, you can go ahead and try to use the Google DNS server. It is more reliable to use rather than other DNS servers. For you to be able to modify your DNS server, here are the things that you need to do. Step 1: Go ahead and launch the Setting of your iPhone device and then go ahead and tap on the “Wi-Fi” option. Step 2: And then, go ahead and tap on the icon that is beside the domain name. Step 3: After that, go ahead and tap on the “Configure DNS” option. Once that you see “Automatic”, then go ahead and change it into “Manual”. Step 4: After that, go ahead and tap on “Add Server” option and then go ahead and enter the Google DNS server. This could be 8.8.8.8 or 8.8.4.4. If you have already done all the tricks that we have mentioned above and you are still having the same issue, then you can go ahead and do this other solution for you. This is by resetting your network settings on your iPhone device. Doing this will remove all the Wi-Fi passwords that you have and as well as your DNS settings. That is why you have to make sure that you remember your password. Here is how to reset your network settings. Step 1: Go ahead and launch Setting on your iPhone device. Step 2: Then after that, go ahead and tap on “General”. Step 3: Next thing to do is to tap the “Reset” option from the list shown on your screen. Step 4: Then after that, go ahead and tap on “Reset Network Settings”. Confirm this action on the pop-up window that will appear on your screen. The last trick that we are going to show you is by resetting your iPhone device forcibly. This way, you will be able to fix any problem that you are having on your iPhone device which includes the one that you are encountering on Safari browser. Doing a force restart on your iPhone device is just like restarting it on a regular way. You will not lose any of the data that you have on your device. You can check out a guide on how you can force restart your iPhone device because this will depend on the model of the iPhone you have. But if you are using an iPhone 8 or an earlier version or if you are using an iPad, then all you have to do is to press and hold the top or the side button until you see the slider appears on your screen. For those you are using an iPhone X or iPhone XS Max or iPhone XR, then all you have to do is to press and hold the slide button and either on the volume button. Aside from doing all the tricks that we have mentioned above, there is also another way for you to fix various errors that you are having with your iPhone device. And this is by using the FoneDog iOS Toolkit – iOS System Recovery. 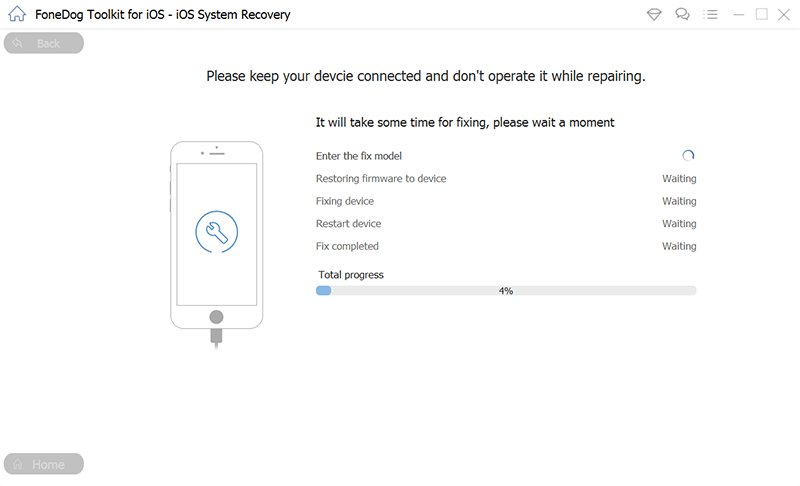 The FoneDog iOS System Recovery will help you in fixing several issues that you might encounter using your iPhone devices such as recovery mode, DFU mode, white screen, black screen, red screen and more. It can also help you once that your iPhone device is not responding or if it has frozen. 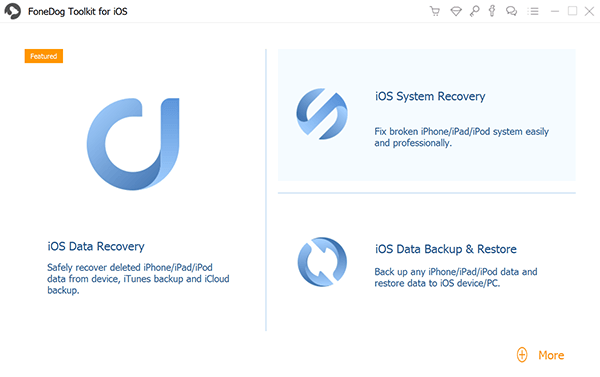 The great thing about the FoneDog iOS System Recovery Tool is that it can fix your iPhone device into its normal state without losing any of your precious data. It can also fic any kind of iTunes errors such as error 3600, error 9, error 14, and more. Another great thing about the FoneDog iOS Toolkit is that it is made compatible with any iOS device. This includes iPhone 8, iPhone X, iPhone 7, iPhone 8 Plus, iPhone 6, iPhone 6s and even those old iPhone devices. 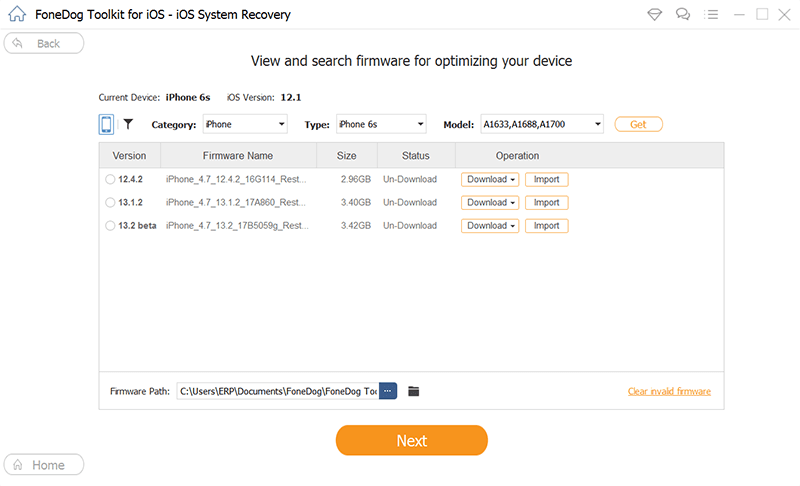 To know how to use the FoneDog iOS System Recovery tool, we have included here a step by step method that you can follow. First is that you need to download the FoneDog iOS Toolkit from our official website. Once that you are done with the download, go ahead and install it on your PC. Once that you are done installing the program, go ahead and launch it. On the main interface of the program, go ahead and choose “iOS System Recovery” option. After that, go ahead and have your iPhone device connected to your PC using your USB cable. The FoneDog iOS System Recovery tool will then be able to detect your iPhone device. From there, go ahead and click on the “Start” button. And then, go ahead and download the firmware that you need for you to fix the issue you are having with your iPhone device. On your screen, go ahead and enter the correct device type and model of your iPhone device. Do not worry if you do not have the latest iOS version on your iPhone device because the FoneDog iOS System Recovery will be able to download it for you. Then after that, all you need to do is to click on the “Repair” button. And then wait until the download is complete. Once that the download is done, FoneDog iOS System Recovery will then start to repair your iPhone device automatically. This time, you should not use your iPhone device or disconnect it from your PC. If you do, then there is a high chance that your iPhone device might be at risk of getting bricked. The repairing process may take some time so all you have to do is to wait patiently. 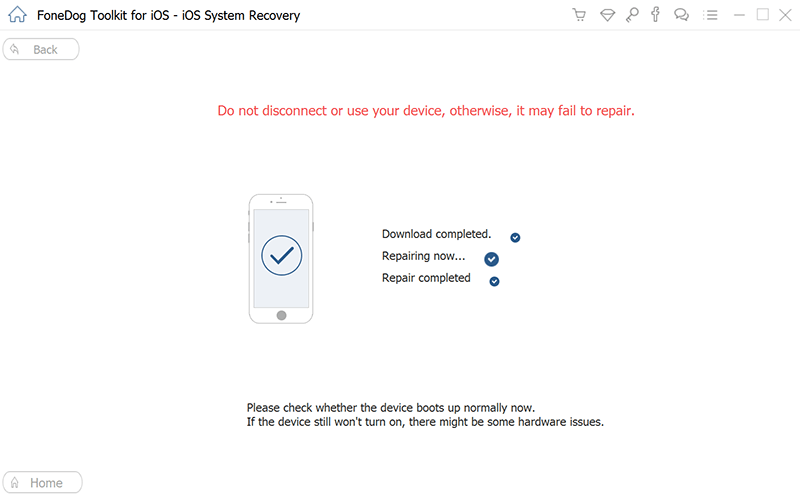 The FoneDog iOS System Recovery will then be able to notify you once that the repairing process is complete. However, you are still not allowed to unplug your iPhone device from your PC once that the repair process is complete. You have to wait for your iPhone to reboot first. Once that your iPhone device is back on, then that is the only time that you can disconnect your iPhone device from your PC. [Solved] Forgot Passcode for device, or iPad is Disabled? Fixing the error “Safari cannot open the page because the server cannot be found” is pretty simple, right? All you have to do is to apply all the solutions that we have provided above and see if which one will work best for you. And then we also have a tool that you can use for you to be able to fix other issues that you might have with your iPhone device. And this is the FoneDog iOS System Recovery tool. Using this tool will be able to help you in fixing various issues on your iPhone device in no time.